Working from home has its benefits and its low points. I love having a home office that allows me to work from home and still be close to the family. My office is right off of the kitchen and front room of the house - this allows me to be close to the center of the home and also look out the front windows to see what’s going on in our world. This office space has evolved over the years but I love where I’ve ended up. 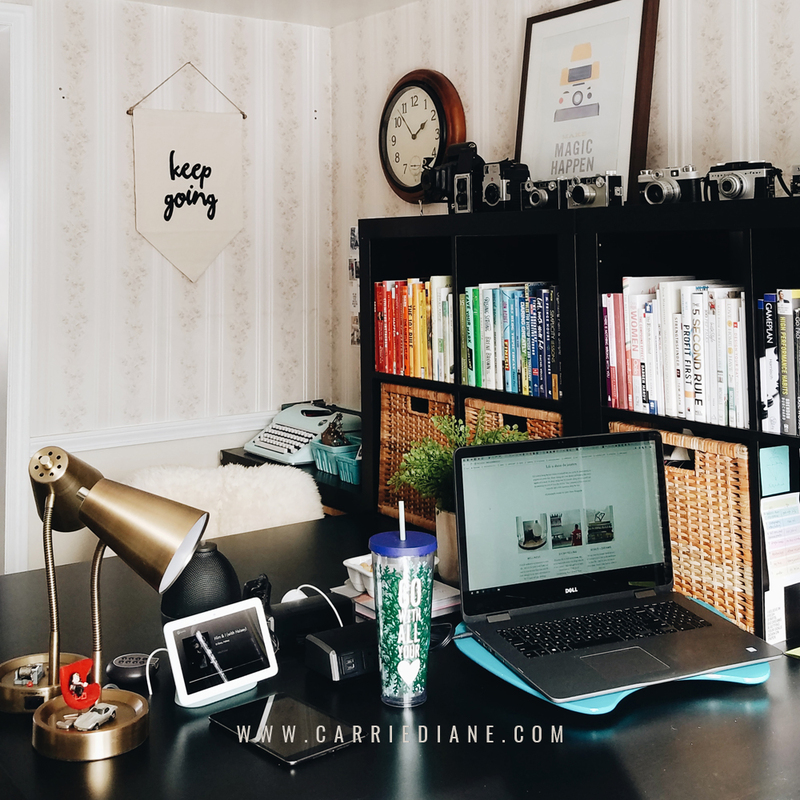 Check out this old post about finding inspiration for your home office on the Carrie Owens Photography blog. And if you want to see what it used to look like check out my old home office when I was more of a scrapbooker and photographer, things have slowly changed and I’m loving where my space is now. 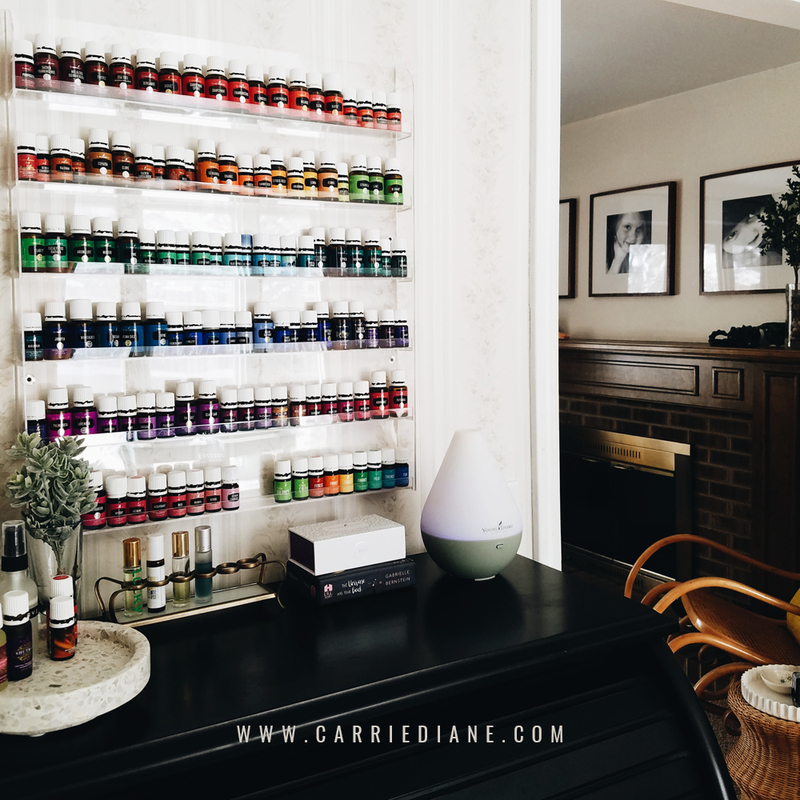 I love my oily station in my office - so accessible to anyone in the family and the perfect spot to mix up some rollers or sprays or other fun stuff. Do you have a home office? I would love to see! What are your biggest struggles with your home office space? It’s that time of year - I love it! I love all of the things about the new year. People always say that there’s nothing special about January 1st, that you can make a change any time and any day. They are 100% correct - but for me, there is still something magical about the first of the year. It’s amazing to me to thing that the things that I’m going to be doing at the end of this same year may look nothing like what I imagine today. That’s ok, life is full of changes. But I like to plan and prepare the best that I can. So much so, in fact, that I often over plan…or intend to over plan. I have always looked for that perfect planner, that perfect idea on how to set and achieve goals that I often find myself in a continuous planning loop without actually doing the work that I’m planning. Of course soon comes disappointment or discouragement or thoughts that maybe my idea isn’t good enough when it’s really just that perhaps I gave up before it got really good. But still…I plan. Because some planning and hoping and trying is better than nothing in my book. I also really love to highlight tasks once they are finished. Even if I write them in just to cross them out. My planner of choice is the Get To Work Book by Elise Cripe (one of my favorite bloggers and instagrammers and overall super creative talented types) and you can see from my post about planners back in 2017 I’ve been using it for a few years. Things that happen every year like birthdays and anniversaries that I need to make sure to remember. Any sporting events that I know ahead of time (sometimes I know these things, sometimes I don’t and then I’ll just add when they become available). My blog posts that I have planned out using my blog planner (this keeps me accountable and also reminds me of things that I need to get photographed or purchased for upcoming posts). After those items are entered in I will often go to the the weekly pages for January (or the upcoming month) and start filling in certain things that I know that I need to do daily (water, vitamins, instagram posts, blog posts, etc). I like having these on the actual days so that it gives me something to highlight when they are done and also keeps me on track. I will also go in and enter dates from the monthly calendar now so that I can write down any tasks/to do lists that coordinate with those events. There are also some awesome project pages and reflection pages in the planner that I use every month as well. These are perfect for mapping out a big project you’re working on into smaller, bite sized pieces so that you can actually start tackling your to do list without being completely overwhelmed. As I mentioned above I love crossing things off my list, but it wasn’t until I saw someone else’s planner that used a yellow highlighter to run through each item that they had finished that I tried that method. I love it and think that it’s such a great way to get a quick reminder of the things that you’ve accomplished in your day. Do you use a planner? Digital or paper? What is your favorite and why? If you’re looking for a little inspiration for your Get To Work Book, check out the instagram #gettoworkbook for some great ideas. The You Are a Badass books are next up on my reading list - there's both the regular one and You Are a Badass at Making Money - how could I pass that one up?? I've loved The Miracle Morning by Hal Elrod and The 5 Sencond Rule by Mel Robbins...perhaps two of my very favorites. Have you read Elise Cripe's book on 100 Pep Talks - a book she wrote from an instagram series she did a while back. It's a great quick read with a ton of really awesome nuggets of goal driven advice. What business and goal books are your favorite? Are you a physical book reader, a kindle reader or do you love the audio books?